It’s not every day we hear from a customer telling us their home has been chosen as a filming location for a new television drama! That’s exactly what happened a few weeks ago when we got a call from a customer who lives in the Davenport district of Stockport, just a few miles from yoursashwindows.com HQ. 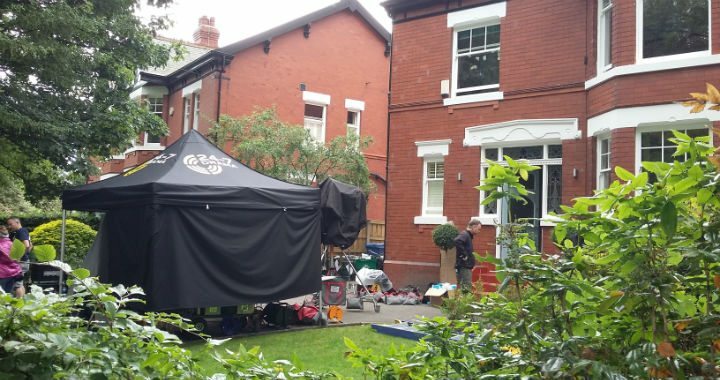 It was as simple as a knock at the door from the show’s researchers, asking if the owner would be willing to allow them to use her property for a new show they are filming in Manchester. The show – a new six-part drama starring Robson Green, Sue Johnston and Lisa Riley – has been filming at various locations in Manchester city centre and the surrounding areas over the last few months. Our customer has only recently had restoration work carried out on the sash windows of her gorgeous Georgian property. The sash boxes are still in good condition and didn’t need replacing in their entirety, instead we put double glazed sashes into all of her 17 sash boxes. The joinery work was completed at the end of March and the painting finished at the very beginning of May. In fact, we’re led to believe that the windows played a big part in the house being selected for the show! We’re pleased as punch to learn that one of our customer’s homes, and the fantastic work our lads have completed, will be viewed by millions when the show airs in early 2018. If you live in a period property with original sash or casement timber windows that are in need of repair, please contact your local yoursashwindows.com team. We can’t promise your home will then be selected to feature in a television show, but we can guarantee high quality workmanship and materials. We are period property joinery specialists and can restore or replace your existing windows with exact double glazing replicas. We can even arrange the paperwork for any planning permission that is required in relation to listed buildings or properties within a conservation area. Please call us on 0333 6000 196, email enquiry@yoursashwindows.com or complete our short ‘Book A Survey’ or ‘Call Me Back’ form on our website.